An improv gig is a gamble by definition, relying primarily on the mood and temperament of the musicians, individually as well as collectively. Thankfully, this hour-long performance, which gels far more often than falls apart or searches for cohesion, was captured for those of us not in attendance to enjoy. The set begins tentatively, but starts to flow after just a couple of minutes when Han-Earl Park begins to pull the group together with bowed drones and arhythmic picks on his guitar. 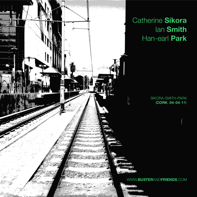 Catherine Sikora picks up the call and starts playing full, purposeful runs on her sax that take the lead while Ian Smith contributes muted trumpet splatters. Suddenly, Park’s guitar rises and falls w/ quick figures via the use of a volume pedal, simultaneously taking the lead away from Sikora and leading the group to another place. The performance’s centerpiece, “Red Line Speed,” best represents the trio’s interplay and dynamics. There is a moment where you’d swear you were listening to a Sonny Rollins and Derek Bailey duet. Smith plays spastic trumpet figures with a mute, while Sikora plays fluid lines and Park darts in between them. Smith plays a short solo of hissing sounds. My favorite moment occurs when Smith sounds like a drunken bumblebee & Sikora plays spiral figures as if she’s waving her arms, shooing him away. Then Park appears with sonic smacks, clumsily chasing the bee with an oar. When the piece comes to an abrupt end, amid trilling saxophone, muted trumped, and guitar smears, it sounds like they ripped a peanut butter sandwich apart and smashed it back together with the captured bee inside. Park is especially adept at steering the group down side streets they might have otherwise ignored and utilizes simple techniques to arrive at unique sounds, such as sticking a piece of metal between the guitar strings & then finger-picking to approximate an alien banjo. Sikora is often the anchor of the trio, grounding them in traditional sonic terrain while playing every bit as imaginatively as the more unconventional Smith and Park. Smith frequently surprises with blurts and burps in one second, and full open tones in the next. He also utilizes the mute as often as not. Of course, it’s the build-up that makes the magical moments exciting; but those lulls are never a long wait as there is a new surprise around nearly every corner throughout this often fascinating performance. Although I am rather on Philipp Coombs' side as to the rating this is a very nice review, I especially like the comparison with the bumblebee. It is a great image, the review is really nicely written.